Entry for the NEW 2019 UltraNite is now open! 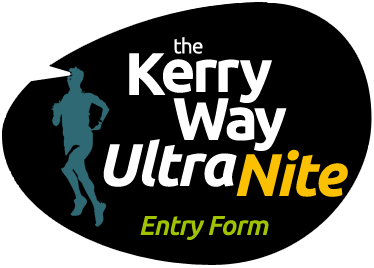 To enter The Kerry Way UltraNite, please fill out the application form below. Please note: closing date for registration is July 31st 2019. The fee for The UltraNite is €115.00 per person. We use Paypal to accept payments. Once you have filled in the form below you will be directed to Paypal for secure payment. A physical examination is not required to compete in The Kerry Way UltraNite but is recommended! I affirm that I am in good health, suffer from no known conditions which will endanger my health or the health of others, and I am fit to compete in the event. In the case of injury or illness I will bear the cost of any evacuation procedures such as ambulance, helicopter, rescue and professional medical care. I understand that I must provide my own health and accident insurance. I give the organisers full permission to use any photographs, videotapes, recordings or any other record of this event for any legitimate purpose. I understand that race entry fees paid by me are non-refundable unless the registrar refuses my entry. The non-refund policy also applies to any cancellation of the race due to weather, fire or any other conditions.